When Lazav, the Multifarious enters the battlefield, surveil 1. I feel like this card would be better if there were a beneficial reason to have it change often from one creature to another in the graveyard. I suspect that in most games, this ability will only be activated once or twice. It would have been more interesting if, instead, it exiled itself and returned to the battlefield as a copy of the creature, thereby being able to trigger the copied creature's ETB effect. I don't think you can look at this card in a void. Lazav's entire guild keeps giving you the chance to load the graveyard with Surveil. So you're gonna have the chance to constantly upgrade Lazav to whatever graveyard creature you need. 3 mana 12/12? Sign me up! It's better than that. It's a Tormented Soul that can turn into said 12/12. 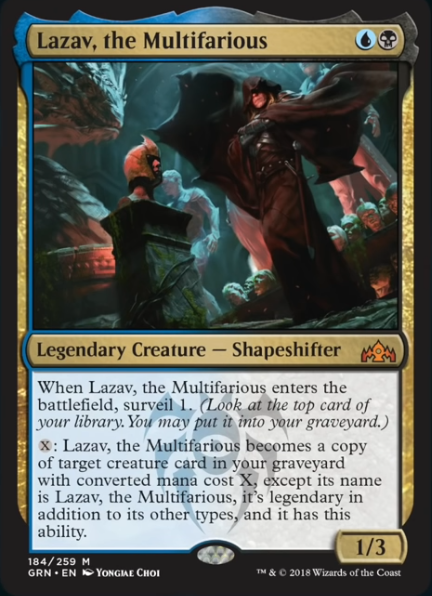 Well you'd have a legendary Polyraptor named Lazav, the Multifarious that, when it takes damage, makes a copy of itself, and then either the copy or the original immediately dies to the Legendary rule. Seems absolutely pushed and marvelous. That CMC means it has a good chance at being a multi-format champ. Lots of abuse potential. This might be one of my favorites of the set so far. Totally, he'll be a great commander. Personally, I'm thinking about seeing if he'd make for a fun Death's Shadow 5-8. Seems great with any undercosted creatures with drawbacks since a lot of times the drawback is an ETB or cast cost. Just a fun card. Definitely scooping up. He makes me want to start brewing a Dimir self-mill EDH deck with him at the helm. Man Phyrexian Dreadnought has just been getting all of the best toys lately. How does this card work with Ertata, the silencer? Since Lazav keeps his name is he still unblockable with Ertata’s ability, or would he just be a plain old 3/5. Pretty sure I know the answer, but just throwing the question out there for clarity’s sake. Ertata, the Silencer can’t be blocked.